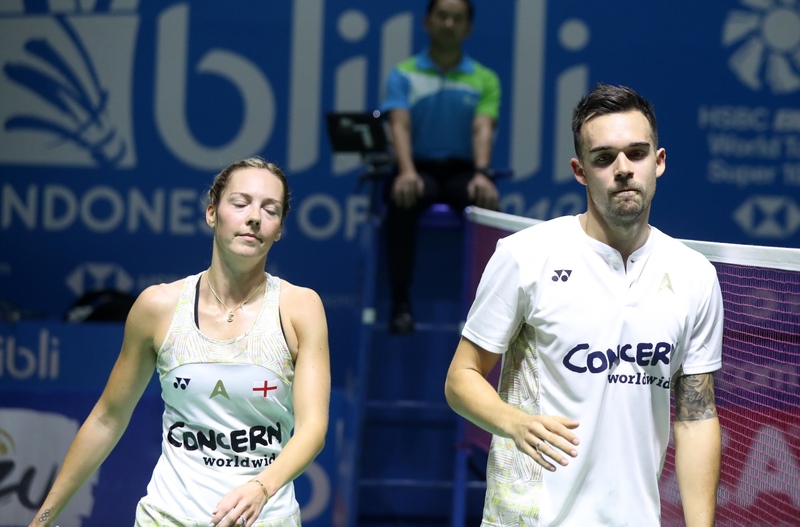 Some of Europe’s biggest names stood up to the might of Asia today, toppling the title-holders in Women’s Singles and Men’s Doubles at the BLIBLI Indonesia Open 2018. 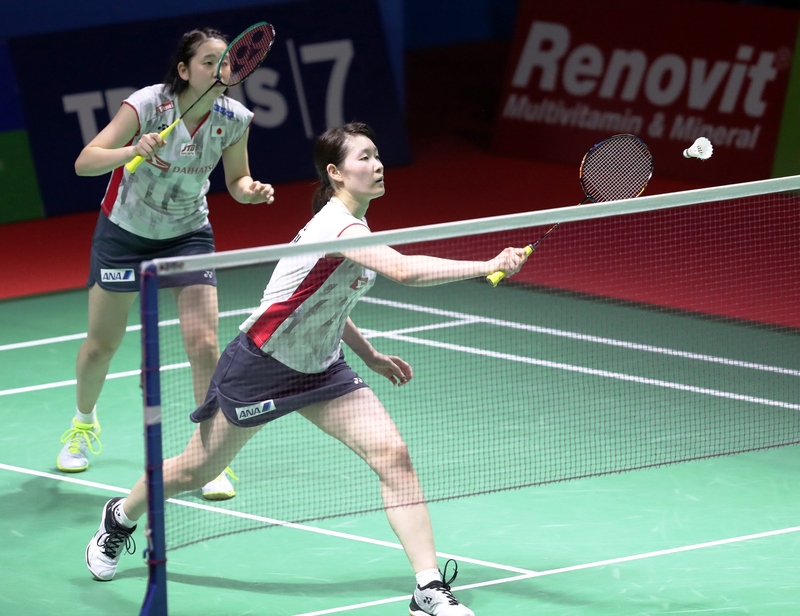 A day after Sayaka Sato miraculously escaped a first-round defeat by Spain’s Carolina Marin, the Japanese champion’s defence of the women’s solo event was halted 21-19 17-21 21-14 by Kirsty Gilmour’s all-court prowess, including some clinical jump-smashing. Following the Scotswoman’s inspired performance, her continental brethren – Vladimir Ivanov and Ivan Sozonov (featured image) – steamrolled Li Junhui/Liu Yuchen in straight games to ensure a new pair will stand atop the Men’s Doubles podium on Sunday. The Russians’ 21-19 21-15 success was carved out from their accustomed pattern, with Sozonov patrolling up front while his imposing partner thundered smashes from the baseline. “I tried to play soft and carefully at the net and Vladimir was powerful and attacking. 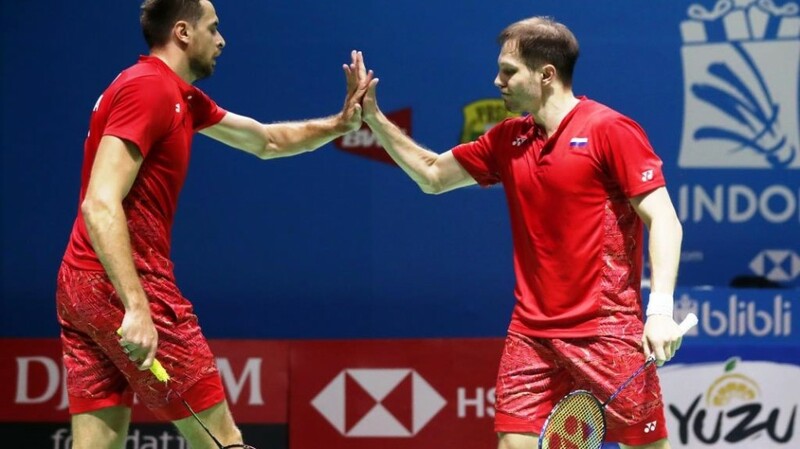 Now we want to focus on tomorrow and we look forward to that match,” said a happy Sozonov, referring to their quarter-final versus Takuto Inoue/Yuki Kaneko (Japan). By contrast, Liu appeared dazed and was at pains to explain their half-hour rout in the second round. “I don’t know what happened. Maybe we were too relaxed,” surmised the Chinese competitor, complimenting their opponents for playing well. There was similar praise for Gilmour from a dejected Sato her weak shot into the net ended their duel. Stating candidly that Gilmour’s speed was too much for her, the 27-year-old admitted that ultimately she could not keep up with the energy from across the net. “She was just too fast. I am disappointed to lose. I love playing in Indonesia with this great crowd support,” said Sato. For her part, Gilmour credited her change of pace and sticking to her game plan for her victory. “I had a plan and I had to adapt it a little but I am really happy because the conditions were difficult. I got a good grip on them and I tried to take advantage of any loose shots,” she explained, adding that her jump smash is another strength that helped her cause. 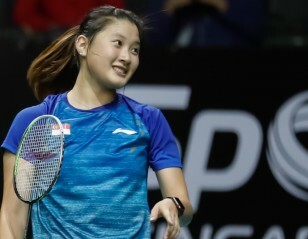 Contemplating her next match versus top seed Tai Tzu Ying, the 24-year-old said that while she has “had a taste of quarter-finals” she hopes to be more consistent and is eager to go deeper in tournaments. 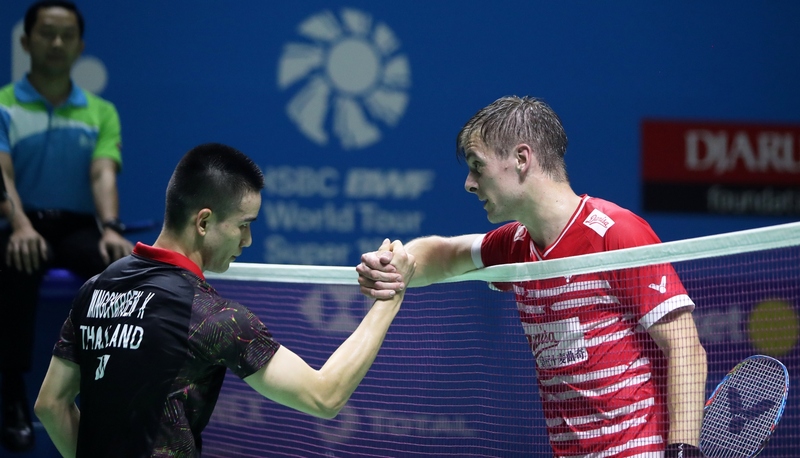 Denmark, of course, led the European charge with Viktor Axelsen progressing in Men’s Singles while his Men’s Doubles peers, Mads Conrad-Petersen and Mads Pieler Kolding, came through – 21-12 21-17 – against Indonesia’s Ricky Karandasuwardi and Angga Pratama. For a moment, Jelle Maas/Robin Tabeling of Netherlands threatened to flip the script on Fajar Alfian and Muhammad Rian Ardianto, extending the local lads to three games. However, the latter buckled down in the decider to prevail 21-18 19-21 21-14. “We showed that we can challenge these guys if we get our tactics right. We gave them a hard time but in the third game they were really sharp and grabbed a good lead. We fought back but it wasn’t enough. At this level, we have to play quality shots every time, otherwise the opponents get the initiative,” assessed the Dutch duo. Along the way, Europe suffered some casualties, including Kim Astrup/Anders Skaarup Rasmussen (No. 8 Men’s Doubles seeds), Mathias Christiansen/Christinna Pedersen (No.6 Mixed Doubles seeds), Chris/Gabby Adcock (No.8 Mixed Doubles seeds) and Brice Leverdez (Men’s Singles). Meanwhile, some interesting quarter-finals took shape across all five categories, with China’s No.5 seed Chen Yufei pitted against Akane Yamaguchi (No.2 seed; Japan) in Women’s Singles while Thailand’s Ratchanok Intanon clashes with Sung Ji Hyun of Korea and India’s Pusarla V Sindhu faces China’s He Bingjiao. Wily veteran Lee Chong Wei continues to enjoy himself against the young brigade in Men’s Singles. Having dispatched blossoming Dane Anders Antonsen tonight – 21-12 21-15 – the Malaysian No.7 seed will oppose Thailand’s Kantaphon Wangcharoen for a semi-final berth. Tommy Sugiarto is also staking a claim for honours in his home event as he challenges Kento Momota of Japan. The other two quarter-finals feature No.3 seed Shi Yuqi (China) versus India’s HS Prannoy and top seed Axelsen against Kanta Tsuneyama of Japan. 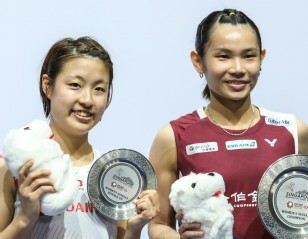 Women’s Doubles top seeds, Chen Qingchen/Jia Yifan (China), will aim to stay on track in their title defence when they meet Korea’s No.6 seed, Lee So Hee/Shin Seung Chan. Another riveting contest will be Indonesia’s Greysia Polii/Apriyani Rahayu versus Japan’s Yuki Fukushima/Sayaka Hirota while two emerging duos – Hsu Ya Ching/Wu Ti Jung (Chinese Taipei) and Mayu Matsumoto/Wakana Nagahara (Japan) – fight for a semi-final spot. Tomorrow’s action starts at 12 noon with Tontowi Ahmad/Liliyana Natsir eager to take another step in defending their Mixed Doubles crown. The pride of Indonesia will be up against experienced Chinese star, Zhang Nan, and his young partner, Li Yinhui. China has two other pairs in the mixed quarter-finals while Indonesia is assured of a semi-final place with Ricky Karandasuwardi/Debby Susanto up against their team-mates Hafiz Faizal/Gloria Emanuelle Widjaja.